Rainer Zietlow and his team are again driving in a Volkswagen Touareg, this time in a new FeVolkswagen Touareg V6 TDI with the new "Facelift". 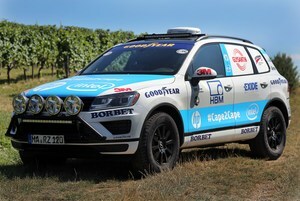 The Touareg became some kind of a home for the team, as for all world record drives it has been a Touareg. After the accident in 2014, the Touareg has been completely rebuilt at the Volkswagen factory in Bratislava, with a great job of the team form the pilot hall. We are really grateful to have such a strong partner, with such a motivated and had-working team to make the long journey during the record drive as comfortable and safe as possible. Also it has been adapted to be capable of taking this extreme challenge from South Africa to Norway. For example a stronger suspension was added, larger tires, a roll-cage, extra strong Hella head lights as well as additional tanks for a range of in total 3.000 km. The 244 HP V6 TDI engine as well as the all other parts around like gear box and driving shafts are standard. Hewlett Packard, Intel, IAV and HBM equipped the car with measuring instruments, which will provide live information about acceleration, brake performance and the pitch of springs. 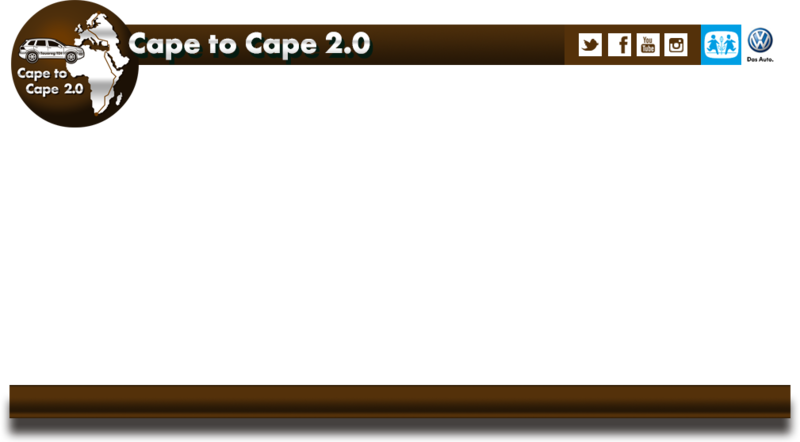 Follow these information during the world record drive on the hp cape2cape app – www.hp.com/go/hpc2c. The team communicates via the latest satellite communication system of Inmarsat, which does also provide tracking information, which you can see on our homepage. The Touareg runs again on 275/65R17 Goodyear Wrangler all weather tires with which the team had no tires puncher in 2014. The Borbet rims C2C, which were particularly developed for this record drive. The cooling system of the Touareg is filled with Glysantin® the premium engine coolant from BASF. Even under extreme conditions Glysantin® protects all year round from corrosion, overheating and frost. The Touareg front is half covered with a brand new 3M™ Scotchgard™ Pro Paint Protection Film which provides high protection against stone chips or chemical influences. The Touareg uses a strong 88A battery from Exide, to keep all additional electronic gear running throughout the whole record drive.